A lot of times we get calls from individuals asking how they can light their pilot light. You can watch the video above or follow these basic steps! Before you begin, be sure that your damper is ALL THE WAY OPEN and that your glass doors are ALL THE WAY OPEN. By having your damper and doors open this will ensure proper ventilation and prevents the valve from overheating. In addition, this protects the glass from breaking. Before beginning, look at Figure 1 to locate the parts. 1. Locate the value on the side of your unit. Push in the IGNITOR CONTROL KNOB and turn it clockwise to off. 2. 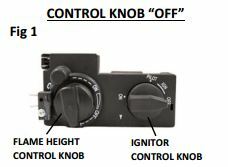 Turn the IGNITOR CONTROL KNOB counterclockwise to PILOT. Push the CONTROL KNOB in firmly and hold. 3. Then, hold a long fireplace match or lighter near the THERMOCOUPLE on the pilot assembly. Continue to hold the control knob for about 60 seconds after the pilot is lit and then release the knob. The pilot will remain lit. BUT WAIT, WHAT IF MY PILOT STILL DOES NOT LIGHT? If your pilot light still does not light, then you need to repeat the steps. If it does not light after several attempts, you will need to call a professional service technician. To find a professional service technician, you can contact through going through sites such as Angies List, Yelp or Home Advisor. We recommend using professionals that have been approved by these service sites in order for you to find a reputable service technician.